The company posted an improved net income of 2.4 percent, a little over two cents per revenue dollar. Despite a significant rate increase in 2016, ACA losses continued offset by gains in other lines of business. Blue Cross spent more than 81 cents of each premium dollar on healthcare services; more of customer premiums paid for health care. DURHAM, N.C. – Blue Cross and Blue Shield of North Carolina (Blue Cross) continued to improve financially in 2016 due to reduced losses in its Affordable Care Act (ACA) business, strong investment performance, and gains in other lines of business. The company reported a net income of 2.4 percent of revenue. Losses on ACA plans continued despite a significant rate increase in 2016. Blue Cross reported a $38 million loss on ACA plans in 2016, compared to a loss of more than $400 million in 2014-2015 time period. *Financial results, excluding months in reserve, are GAAP consolidated results. Blue Cross expects to again exceed federal requirements that insurance companies must spend a portion each premium dollar on healthcare services. On average across all lines of business, Blue Cross spent more than 81 cents per premium dollar on customers’ medical care in 2016 (Medical Care Ratio). 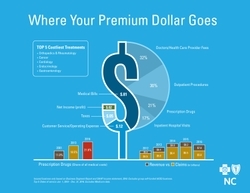 The share of customers’ premiums going toward prescription drugs continues to grow. Drugs now make up about 22 percent of all health care costs. This has roughly doubled over the past 15 years. Specialty drug costs remain high. Many branded drugs and some generics are also rising sharply. The company closed out 2016 with 250,982 ACA customers. ACA customers make up less than 10 percent of Blue Cross total membership. As Blue Cross projected, the ACA group remained older and sicker than non-ACA customers. This book of business was responsible for an operating loss of $38 million. ACA customers continued to be high users of medical care across the board in inpatient, outpatient, professional services and pharmacy. This population’s use of orthopedics procedures and specialty drugs was significantly higher than other members. The average ACA customer had twice the emergency room costs than the average customer under age 65 in 2016. The company’s customer base fell slightly to 3.74 million down from 3.89 million in 2015. This includes over 1.1 million members served on behalf of other Blue plans. Most of the losses occurred in individual ACA business. Stable pricing of ACA plans remains a challenge. Rate increases, while necessary to cover the high cost and use of medical care for this population, may have deterred some customers from enrolling or keeping their plans. State law requires the company to maintain reserves at 3 to 6 months of claims and administrative expenses in order to ensure financial stability for its customers. Blue Cross finished 2016 maintaining reserves at a responsible level of 3.7 months. As a fully taxed company, Blue Cross incurred $478.1 million in local, state and federal taxes and fees in 2016. Blue Cross and Blue Shield of North Carolina improves the health and well-being of our customers and communities by providing innovative health care products, services and information to more than 3.74 million members, including approximately 1.1 million served on behalf of other Blue Plans. Since 1933, we have worked to make North Carolina a better place to live through our support of community organizations, programs and events that promote good health. We have been recognized as one of the World’s Most Ethical Companies by Ethisphere Institute every year since 2012. Blue Cross and Blue Shield of North Carolina is an independent licensee of the Blue Cross and Blue Shield Association. Visit BCBSNC online at bcbsnc.com. All other marks are the property of their respective owners.